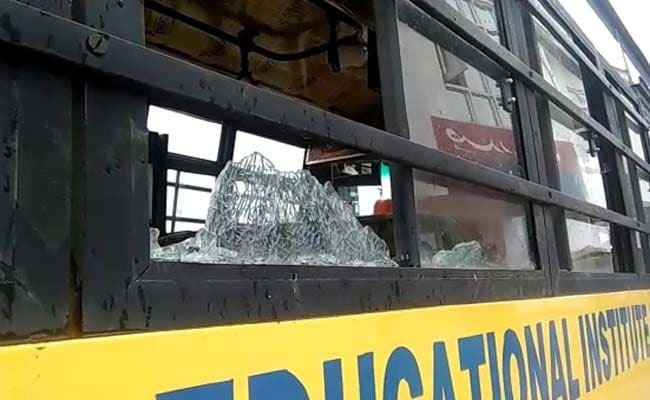 Two children were injured, one critically, when unknown people threw stones at a school bus this morning in Shopian in south Kashmir. There were more than 50 children on the bus, including four-year-old nursery students of a private school. A Class 2 student who suffered a head injury is critical in a hospital in Srinagar. Another boy hit on his head was discharged after treatment. "My son has been injured in stone pelting, this is against humanity. This could have been anyone's child," said his father. The police are looking for the stone-throwers. "The stone pelters hurled stones around 9.25. The bus belongs to Rainbow International school," said police officer Shailendra Kumar. There was immediate condemnation across the political spectrum. The chief minister of Jammu and Kashmir Mehbooba Mufti tweeted, "Shocked and angered to hear of the attack on a school bus in Shopian. The perpetrators of this senseless and cowardly act will be brought to justice." Chowdhary Zulfikhar Ali, the education minister of the state has condemned targeting of the school bus. The leader of National Conference Omar Abdullah tweeted, "How does pelting stones on school children or tourist buses help advance the agenda of these stone pelters?" He also said, "Amnesty granted to stone-pelters was meant to encourage more reasonable behaviour but some of these goons are determined to use the opportunity given to them to just pelt more stones." "Complete madness how stone pelters are targeting young school children," said SP Vaid, the police chief of Jammu and Kashmir. Miscreants pelted stones on school bus of Rainbow School Shopian resulted in injuries to 2nd class student Rehan.He has been shifted to SKIMS for treatment with head injury. Complete madness how stone pelters are targeting young school children. These criminals will face the law. It is not clear whether the school bus was the target of the stone throwers or it was caught in clashes. In January, at Gurgaon in the national capital territory, a school bus was the target of a mob protesting against the film "Padmaavat". More than a dozen children of the GD Goenka World School, from nursery to Class 12, were on the bus on their way home, when teachers and students had to duck between the seats, to take cover from the hail of stones.